April 2, 2014 – Testifying before a Senate subcommittee, University of Houston Law Center tax Professor Bret Wells Tuesday called for stricter controls on multinational companies to prevent them from allocating taxable profits to “tax haven entrepreneurs” overseas. 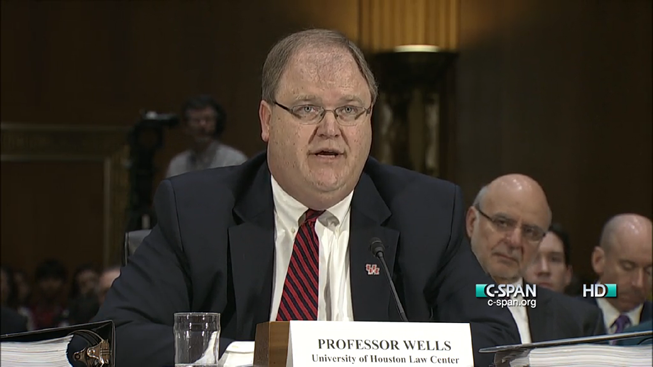 Wells, who specializes in federal income, corporate, and international taxation, testified before the U.S. Senate Permanent Subcommittee on Investigations of the Committee of Homeland Security and Governmental Affairs. He was invited as an expert witness by Senators John McCain, R-Arizona, and Carl Levin, D-Michigan. The hearing involved the offshore tax strategy of Caterpillar Inc. which restructured its spare parts supply chain in 1999 to allocate a greater percent of its profits to an affiliated company in Switzerland. Although nothing else had changed in the design, production, or management of Caterpillar’s lucrative spare parts business, Wells testified, the “dominate share” of taxable profits was shifted to the foreign company. Click here for Wells’ written testimony and webcast of the hearing.